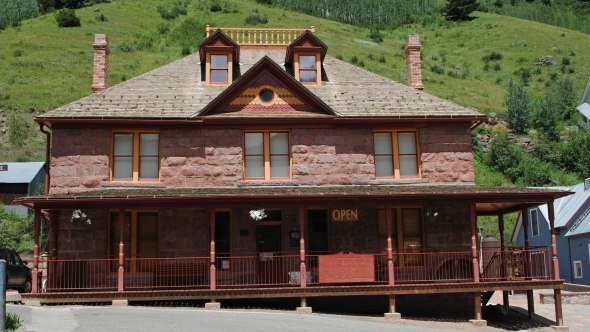 The Telluride Historical Museum has 10 rooms with exhibits on Telluride’s history, including the Native Americans who first lived here, the miners who built the town, the railroad that made it boom, and the skiers who brought it back from a steep decline. There are numerous historic photos and interactive exhibits, plus a mining exhibit outside. The museum’s rarest piece is the Telluride Blanket, a cotton weaving from the Anasazi culture that has been carbon dated to between 1041 and 1272. The blanket, which is nearly five feet square, was discovered by ranchers Mel and Ed Turner in a Utah cliff dwelling around 1896, and they gave it to Telluride banker W.E. Wheeler, possibly as payment for a debt. Wheeler died in 1935, and the blanket remained stored in a leather trunk as part of his estate until it was discovered in 1970. The museum occupies the two-story stone building formerly known as the Old Miner’s Hospital or Hall’s Hospital after Dr. H.C. Hall, a surgeon who opened the hospital in 1893 to serve miners, townspeople, and the poor. During strikes by miners several years later, the National Guard used the hospital as barracks and union miners were turned away. As a result, the Western Federation of Miners built the Miner’s Union Hospital Building a few blocks away. The old hospital operated until 1964, when it was closed because of Telluride’s falling population. The museum opened in the hospital building in 1966, but part of the exterior masonry crumbled in 1995, spurring a seven-year, $2 million renovation project. The museum has 10 rooms with exhibits on Telluride’s history, including the Native Americans who first lived here, the miners who built the town, the railroad that made it boom, and the skiers who brought it back from a steep decline. There are numerous historic photos and interactive exhibits, plus a mining exhibit outside. The museum sells prints of more than 150 photos from its collection, including Colorado Avenue in 1884, 1887 and 1890, William Jennings Bryan reprising his “Cross of Gold” speech in front of the Sheridan Hotel in 1904, the cribs on Popcorn Alley (undated), damage from the flood in 1914, and boxer Jack Dempsey sparring in 1910. The museum also sells downloadable podcasts of five tours of historic Telluride.